Colorists at hair salons can mix hair dyes together to create almost any color imaginable. 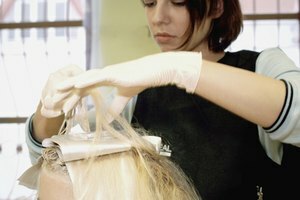 Unfortunately, getting your hair dyed at a salon is usually a costly experience. Luckily, you can mix your own custom colors at home using hair dye from the drugstore or beauty supply store. If you want to make a color darker, mix it with a darker hair dye from the same brand and product line. Put on a pair of latex or vinyl gloves. Put half, two-thirds or three-quarters of the light hair dye in a bowl if you're using a cream hair dye. 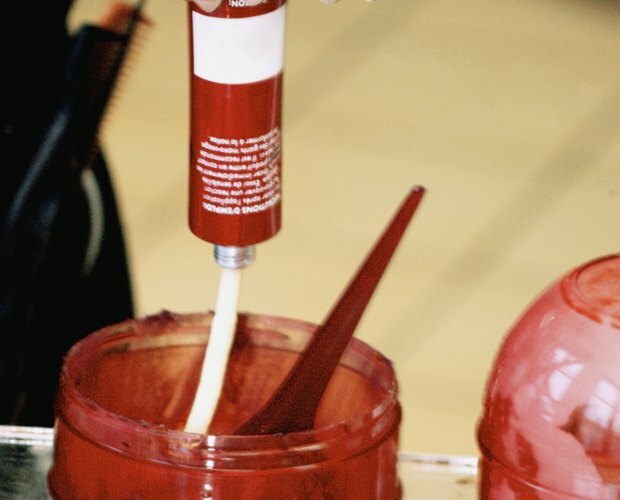 Put the dye in a mixing bottle if you're using a liquid dye. If you want the final color to be considerably darker than the light hair dye, use half of the light hair dye. Put half of the darker hair dye in the bowl or mixing bottle if you used half of the light hair dye. Use one-third of the darker color if you used two-thirds of the light color or one-quarter of the darker color if you used three-quarters of the light color. Mix the colors together with a brush if you're mixing cream hair dyes. Shake the bottle if you're using liquid hair dye. Add the developer, sometimes called the activator, to the hair dye according to the manufacturer's instructions. Always perform an allergy-patch test before applying hair dye. If you're unsure of which colors to mix together, call the hair dye manufacturer for advice, or consult a professional. Do a strand test before applying the dye to ensure you've created the correct color. Mixing hair dyes from different brands or product lines, then applying it to the hair, can result in burns and hair loss. Don't mix liquid hair dye with cream hair dye. They do not mix well.